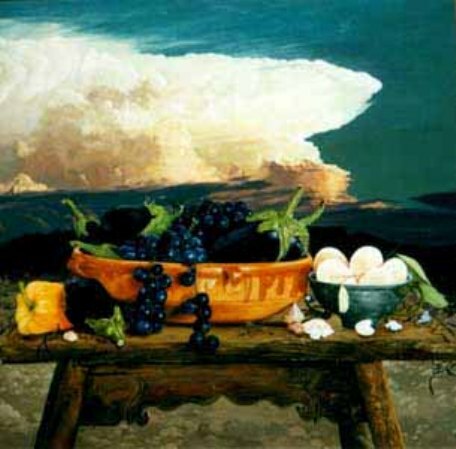 Green began painting still life in 1982 and since then has exhibited widely throughout Australia. She studied at RMIT in the 1960s, married fellow artist Mike Green, moved to Canada where she freelanced for seven years illustrating covers and articles. She returned to Australia in the mid seventies but returned to study in the USA. In 1981, Janet was living in Rockport, Mass, USA while her husband, artist Mike Green was studying at the Museum School. She started working on 12 x 12 inch pieces of masonite, producing still life compositions from the collection of objects she found within the house. She would place vases, plates, and utensils on a superb 11th century refectory table at which she would sit and enjoy the stunning Atlantic sea views. The combination of the rocky coast and Silvan waters integrated itself into her painting, and became her backdrop. The owner of their rented home was a collector of Spanish pewter and Spanish antique furniture. These became the props for the developing still life subject matter. The enjoyment and success she found in these works resulted in Janet taking up painting again on a serious basis after spending the former decade working in complex embroidery, which involved painting on fabric, dimensional pieces and appliqué. 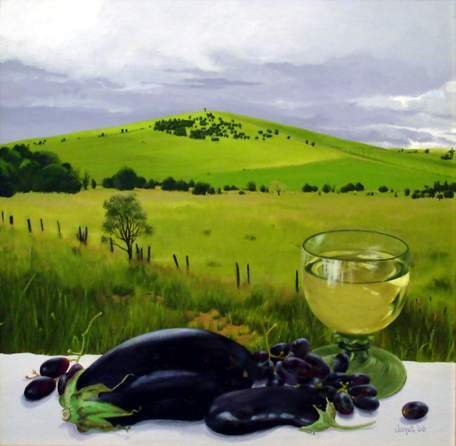 In 1982 she returned permanently to Australia and began teaching and specialising in still life painting. To further her career, Janet looked towards the object around her, ie food, plants, furniture, to form the basis of her subject matter. These together with the vibrant Australian landscape, has resulted in a natural metaphor, which she has taken on as her own. Her interest in still life compositions has led her to researching the genre. While one sees in her work, the influences of Flemish, Italian and Spanish still-life traditional schools, where truthfulness to nature was the rationale, we don't see a full blown flower with a bud to emphasise life's continual circle, in her work. But rather it is the natural environment, the changing mood and variety of the Australian landscape. There is uniformity in composition and her colours tantalise and seduce. She presents beautifully painted fruits, cheeses, vegetables, sea foods and collectables in a captivating reality against a landscape expressing the minutest detail. Her pictures praise the sheer delight of food and nature. Although Green says her aim is to give pleasure it would be naive to think there is no underlying comment. Her mix of objects makes questioning combinations, ripe brie on an oyster shell, a green pear against a white church. In stimulating our senses the work conjures up multiple advertisements - the world looks ripe and ready for consumption. Her chosen working size is the square beginning with the size 31 x 31 cm boards brought home by husband Mike. It has continued as a challenge for Janet to paint with the square, most of her works now being within a 62 x 62 cm format. Observant of buildings, the terrain, colour, soil and vegetation, Green's art elegantly locates the still life within the landscape. ''Travelling Around. S.A.'', Kensington Gallery, Adelaide. ''Wine Country'', Perth Galleries, Perth. Travelling the Pacific to study subjects for forthcomig exhibitions. Painting, Bundanon Artist in Residence Program, Nowra, N.S.W. Designed for Expo '67- Canadian Pulp and Paper Pavillion.